Melanie Mc Donald, artist from Cornwall U.K. Welcome to the online gallery and shop of Melanie McDonald! My life is divided between my home in Newquay, Cornwall and my renovation project - an 18th Century farm - in North Brittany, France. My inspiration comes from the beautiful beaches, skies and seas of Cornwall, Brittany and Scotland. I am a professional artist with BA Hons Degrees in Fine Art and Textile Design. Paintings of Polzeath, Rock and Padstow, Cornwall, UK. I gain much of my inspiration from the Cornish landscape - in particular its beaches and the sea. I love North Cornwall - my paintings often focus on Polzeath, Rock and Padstow. I'm especially interested in the quality of light and the sense of freedom which these lovely places evoke. 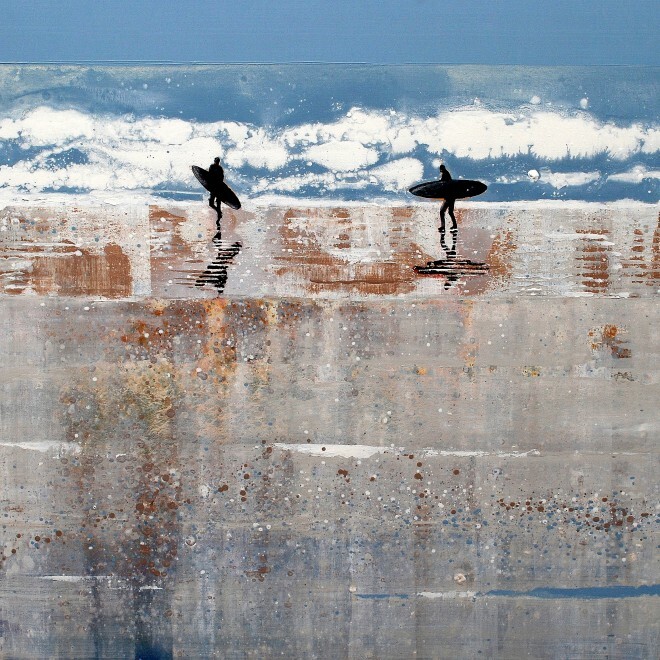 Living next to Fistral Beach, Newquay, Cornwall, and walking my dogs there everyday, I began to get interested in the surfers and the shapes of their surfboards against a background of sea and sky. Over the past few years, I have painted a series of surfer paintings and they are a continuing passion of mine. Recently I visited the West Highlands of Scotland and the Isle of Skye with my husband who is originally from Glasgow. After visiting Scotland earlier this year, I have produced a collection of paintings of Isle of Skye, Arisaig and the West Coast of Scotland. I adore Scotland, so much so that I named my daughter Skye! I plan to revisit the West Highlands of Scotland and Outer Hebrides and continue painting landscapes inspired by Scotland over the next few years. Fine Art - Paintings of Cornwall, Scotland and Brittany. I hope my paintings have the power to suggest the experience of walking on the beach, surfing, or spending time with family. I would like you to feel almost as if you can enter the painting and be transported to that place. I use an evocative, delicate balance of colours with surprising textures. I'm often attracted to shimmering light, silhouetted figures and distinctive shapes such as surfboards. There is often an expanded sense of space in the paintings, reflecting the infinite horizon and endless sky of Cornwall and Scotland. I use the paint in a fluid, watery flow to depict water. Whilst walking on the beach, I watch the colours of the sea and sky change. I take hundreds of photographs and then I translate the images I've seen through my camera lens onto the canvas; the photos are just a starting point - instinct and my imagination soon take over and I am painting from memory. 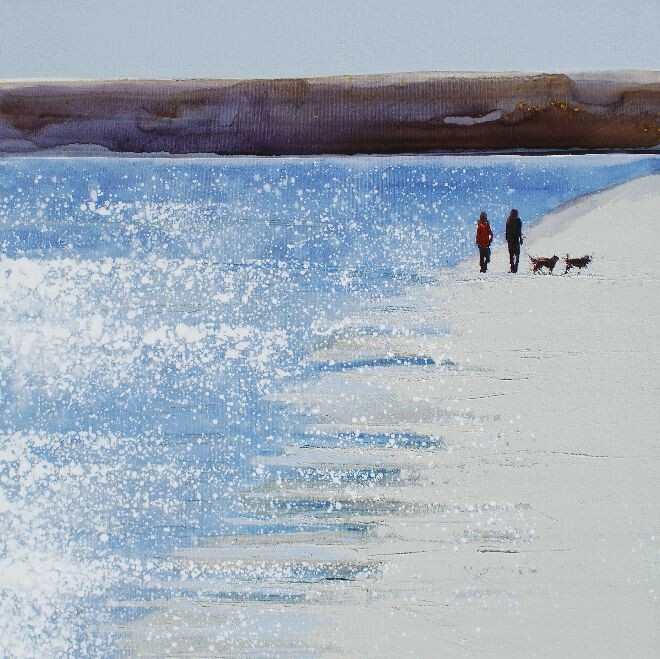 I try to capture the texture, colour and form of the beach scene using layers of colour and varied brushwork. I think many of the paintings have a haunting, ambiguous quality. 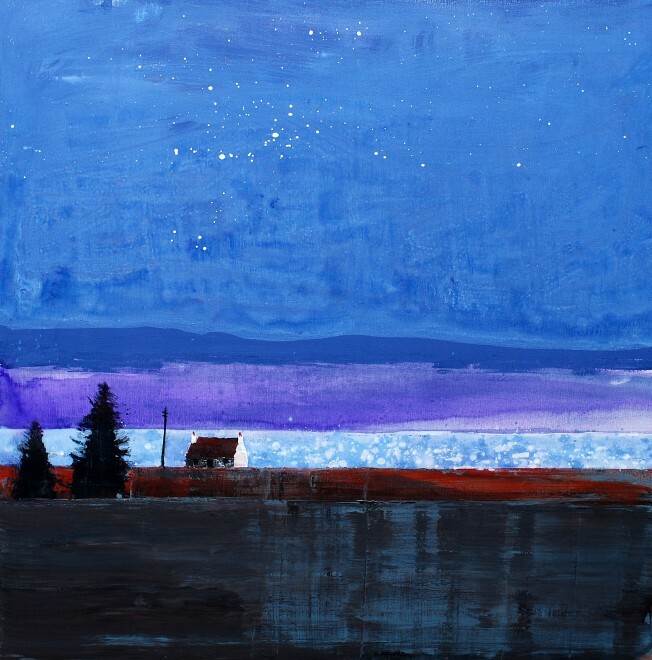 I often feel that my paintings hover between representational landscape and abstract paintings. I have produced a selection of high quality prints of Cornwall which are available on paper or as canvas wraps. Please see the prints of Cornwall section.